Above: Starry Saxifrage, Saxifraga stellaris, photographed in early June in Snowdonia. Picture by kind permission of Andrew Cleave, Nature Photographers Ltd.
Starry Saxifrage is common but localised in the uplands of northern Britain, northern Wales and in the mountains which form a ring around the coast of Ireland. 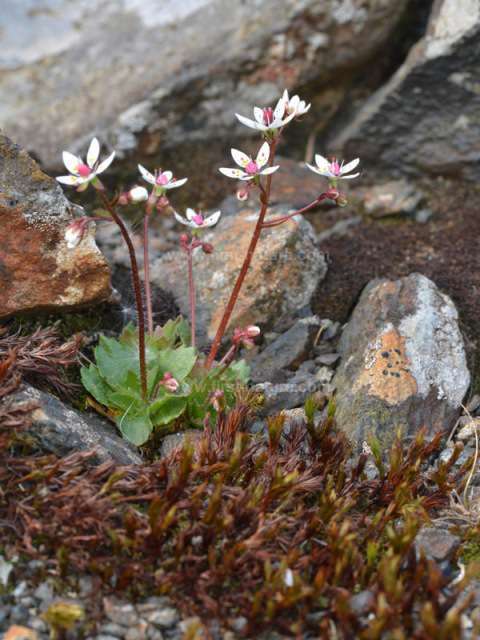 Unlike the other alpine plants that occur in these areas, Starry Saxifrage is the only one that tolerates acid rock. It also grows at lower altitudes than many of the other alpine plants, some rare, which live in these upland or mountainous areas. Good places to see Starry Saxifrage and other of the (sometimes rare) alpines that grow in the mountain ranges in North Wales are Wales's famous National Nature Reserves in Snowdonia: Snowdon NNR and Cwm Idwal NNR. Starry Saxifrage grows to a maximum height of 25cm and has star-shaped white flowers that grow at the top of slender stalks. The leaves, which form a basal rosette, are oval and their edges are toothed. This perennial plant flowers from June to August and grows in damp places such as stream banks.